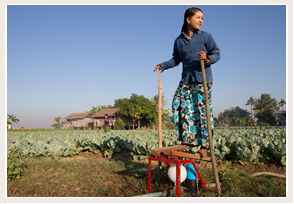 Mission: To move rural Burmese families out of poverty. Our partnership: We have supported Proximity Designs since 2015 with unrestricted grant funding, including match-funding from our sister non-profit Hampshire Foundation. In a country where 70% of the population depends on agriculture, improvements in farming technology and techniques – and the credit to access them – are vital to improve earning potential and living conditions. Proximity Designs is a social enterprise that designs and delivers a range of affordable products to meet the needs of the smallholder farmer. These products include irrigation equipment, crop loans, solar lights and farm advisory services, and are based on a deep understanding of how to boost customers’ productivity and incomes. Find out more about their work on their website.